As all ELCA congregations, Trinity Lutheran is a center for evangelical mission, where people of faith celebrate, learn and connect with one another and others around the world through service and weekly worship. As a church family, we believe we learn and grow in faith through spending time with each other. There are countless fellowship opportunities for our members of all ages and interests, as well as pastoral care and counseling services as needed. This activity group for children in K-5 through fifth grade meets monthly on a Sunday afternoon during the school year for fellowship, games and service projects. Times are announced in the Tidings and the bulletin. Contact Mandi Whitley for more information or if you would like to volunteer! A weekday morning Vacation Bible School is held each summer for children who are three years old through fifth grade. From Monday to Friday, children are involved in a variety of activities designed to help develop and strengthen faith. Vacation Bible School is usually scheduled in mid to late July. Check the calendar for the date each year. Trinity Church sponsors basketball teams for children in the fall and winter. Signups are in September every year. Contact Mandi Whitley for more information. Trinity LCY seeks to provide a balance of worship, service, fellowship, and learning in order to connect the youth with the church and with each other. Most meetings begin with dinner, followed by recreation, discussions, devotions, or off site activities. 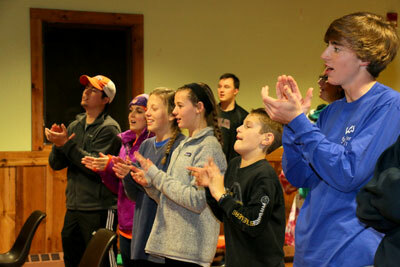 Overnight retreats and mission trips also take place throughout the year. The group normally meets on Sunday evenings from 6:00 to 8:00 pm. Contact Mandi Whitley for more information or if you’re interested in volunteering! The High School Small Group meets throughout the year on Wednesday evenings. Meetings begin at 6:00 pm in the Youth Center. Youth should bring their dinner. Following dinner the youth enjoy a study and conversation on Biblical topics relevant to their lives. Trinity Church sponsors basketball teams for youth in the fall and winter. Signups are in September every year. Contact Mandi Whitley for more information. This fellowship group for young adults meets several times during the year. See the bulletin or the Tidings for monthly details. Trinity Church sponsors basketball teams for men and women in the fall and winter and men’s and coed softball teams in the spring and summer. Signups are in September every year. Contact Mandi Whitley for more information. During the year, the Parish Life Committee sponsors a variety of congregation events including a picnic, a Christmas progressive dinner and a beach retreat. Spiritual growth and relationship building are the focus of these opportunities. A Men’s Bible Study and Fellowship Group meets on the second Tuesday of each month at noon for lunch, and to enjoy Bible study and fellowship. A Women’s Bible Study and Fellowship Group meets on the first Thursday of each month at 9:30 am and 6:30 pm in the Multipurpose Room. All women are invited to enjoy Bible study, refreshments, and fellowship. Trinity Church sponsors basketball teams for men and women in the fall and winter, and men’s and coed softball teams in the spring and summer. Signups are in September each year. Contact Mandi Whitley for more information. Adults’ Night Out offers a variety of fellowship and recreation activities for adults. They are held a few times each year. Contact Mandi Whitley for more information, or if you have an idea. On the fourth Sunday of each month this group meets at a local restaurant for lunch following the 11:15 am Service. Adults of all ages are welcome to attend. The Book Group meets on the third Thursday of the even months at 7:00 pm in the Parlor. Participants come together to discuss books on a variety of topics. The books to be discussed are periodically announced in the Sunday bulletins and in the Tidings. The Lydia Group is a fellowship of women of the church who are interested in instructional study. The group meets on the second Tuesday of each month at 10:00 am in the Parlor. The Leisure/Action Group is a fellowship and travel group for older adults. Monthly activities may include covered-dish luncheons, bridge or other games at the church, and outings to points of interest in the area. Overnight trips are also scheduled during the year. Baptisms, weddings and funerals are scheduled directly with the pastor. Members seeking a pastoral care session with a pastor or a conference with another member of the staff should make an appointment with that person. Trinity Lutheran Church participates in a Membership Assistance Program with Canterbury Counseling Center; members of the congregation pay a nominal fee of $20 per session for the first six sessions of counseling. To make an appointment, speak with one of the pastors or call the Canterbury Counseling Center at 235-7501. Trinity Church communes baptized children at any age mutually determined by the parent(s) and the child in consultation with the pastors. Children who are not communing by the third grade are urged to begin. An instruction class for all third graders and fourth graders is taught every other year. Instruction materials are available for purchase in the Church Office by parents of younger children. After using this material with their children, parents may make an appointment with the pastor to complete the process, so those children may also begin communing. Youth in seventh, eighth and ninth grades receive instruction in the basics of the Christian faith during four Saturday retreats scheduled between January and Palm Sunday each year. An orientation meeting for seventh graders and their parents will be held on a Sunday in the fall. Ninth graders who complete the three year program will affirm their baptism through the Rite of Confirmation on Palm Sunday. A small group of Trinity members assist the pastoral staff in providing care and nurture to parishioners who, due to sickness and declining health, are unable to actively participate in the life of the congregation. Once a month a group of Trinity members are blessed and dismissed at the close of the 11:15 service to take the Sacrament of Holy Communion to Trinity members who, due to sickness and declining health, are unable to attend Sunday morning worship. Youth who wish to serve as Nursery Aides in the church nursery on Sunday mornings must be twelve years old and have Red Cross certification. The Red Cross Baby-sitting Course is typically offered periodically at Trinity Church to help youth meet this requirement. Congregations of the South Carolina Synod, ELCA were asked to develop and implement a policy to protect children and volunteers regarding issues of child abuse. Trinity Lutheran implemented a training program in 2010. All Trinity adults who work with youth or children in any way must complete this training prior to volunteering to work with any children or youth programs. Training sessions are taught each year. The Church Library, which is located on the first floor of the Education Building, contains a variety of books for children, youth and adults. Members are invited to check materials out at any time. Copies of the Lutheran devotional booklets Christ In Our Home (regular and large print) and The Spark Family (for families with children) may be picked up quarterly in the Narthex. These booklets of daily scripture and readings are intended for personal or family devotions. The Trinity Tidings, which is published each month, includes a monthly calendar as well as information about congregational life. You can access the Tidings online here. These two periodicals which contain information and news about the church and faith are available for pick up at the church each month.